The Parish Clergy are available for Confession as a preparation for the Feast. You may call and make an appointment. On Monday, November 7, 2016, the Boston Philharmonic Youth Orchestra will present a Symphony Hall concert in conjunction with Music for Food, a local philanthropic organization which uses concert performances to raise funds and awareness to combat hunger. Monday’s concert will offer an opportunity to donate to the Advent’s Tuesday Night Supper. All donations up to $1,000 will be matched by the Boston Philharmonic! Below are the details from the Philharmonic’s web site. The concert is at 7:30 pm on Monday, November 7, at Symphony Hall. The concert features Finlandia and the Violin Concerto of Sibelius and Prokofiev’s Fifth Symphony. The Boston Philharmonic will pledge to match any cash donations made to Music for Food up to $1,000 with all money going directly to the Tuesday Night Supper Program at the Church of the Advent to aid in the fight against food insecurity. Volunteers from Music for Food will be at Symphony Hall to accept your donations. Donations can also be made online at the Philharmonic’s website: http://www.bostonphil.org/concerts/2016-2017/bpyo1-sibelius-prokofiev. In 1800 there were four or five local organ builders, and in 1850 there were ten, by which time the Church of the Advent had its third organ. The first had been a little foot-pumped melodeon offered in 1844 by the Rector, Dr. Croswell, for the services on Merrimac Street and at the Lowell Street Meeting Hall. When the congregation moved to the Green Street Church in 1846, a new pipe organ was purchased for $350. After this time, the Advent embarked on an extraordinary series of new organs to match the growing needs of the congregation. The third organ was acquired in 1849, the fourth in 1865 with the move to Bowdoin Street. Nine years later this was sold (or perhaps donated by Mrs. Jack Gardner) (3) to the Groton School Chapel. A fifth instrument by the noted Boston builders E. and G. G. Hook was then installed, but it was not satisfactory to Samuel Brenton Whitney, the Advent’s famous organist, and it lasted only a year, being supplanted by the sixth organ in 1875. In 1883, upon completion of the present church’s crossing and nave, the Advent acquired its seventh and penultimate pipe organ. It was a Hutchings-Plaisted Company instrument of considerable size, with three keyboards and pedals, costing $6,750. (4) The pipes and mechanism were located in the present organ chamber with the console directly below in the All Saints Chapel. Of course, this organ (and all previous ones) had mechanical action, that is, hundreds of wooden sticks connecting the keys and pedals to the organ chests above. These sticks (or trackers, as they are called) ran out the top of the console and straight up through the Chapel ceiling, where the outline of the passage may still be seen, now paneled over. As with many such instruments, the mechanical linkage may have been noisy and difficult to manage, for the more stops that were drawn, the harder it was to play. After thirty-eight years of service, Samuel B. Whitney retired in 1908. He was honored by the title organist emeritus and, in 1909, was elected to the Corporation. Thus he was doubtless consulted in 1912 when the twenty-nine-year-old organ was rebuilt with the Hutchings’ patent electric action. (5) The new console, a gift of the Misses Sturgis in memory of Charles Russell Sturgis, (6) stood just under the pipe chamber in the chancel. (Joints in the flooring still show the position.) With a new lease on life, the Hutchings organ continued in use for twenty-two more years. But characteristically, he would not change. Meanwhile, the enterprising company president, Arthur Marks, set about annexing another organ maker, the Aeolian Company of Garwood, New Jersey. Aeolian had produced nearly 900 pipe organs, some of enormous size, but virtually none in churches – for what Skinner was to the Church, Aeolian was to the Home. They specialized in luxurious installations in residences, as well as quite a few on yachts. Almost all had automatic roll players of surprising effectiveness – no organist was ever necessary. The Aeolian Concertola would even play a program of ten rolls in rotation, (9) and in a few installations the Steinway grand could play the harp part – at three pitches. Unfortunately, it was difficult for Ernest Skinner to see that the ideas of a younger man could be more in step with the times. Increasingly, he viewed Harrison’s concepts as a debasement of the tried-and-true Skinner design, and worse yet, a personal affront. As early as 1930 he was openly contemptuous, seesawing between periods of reluctant collaboration and outright warfare. (11) Despite a long-standing perfection of means, the new Aeolian-Skinner Company was torn apart by a confusion of aims. As President, Arthur Hudson Marks controlled the Company stock, and he supported Harrison. Ernest Skinner was encouraged to build his own contracts in his own way, but the dominant thrust of the Company was to be Harrison’s. The sixty-nine-year-old Skinner, annoyed by what was to him unaccountable behavior, withdrew to Methuen, Massachusetts, and there continued building the “authentic” Skinner organ. (12) Gradually the dust settled, and Mr. Skinner leaves our story here. For Harrison to put all his tonal eggs in one basket meant a flurry of mechanical redesign at the factory, as well as extended tonal experimentation in the real acoustical setting of a church building. It became necessary to find a progressive organist and a church close to the factory that would welcome the new and largely untried ideas. So far, Harrison had only one example (and that incomplete) to show of his new work – Saint John’s Chapel at Groton School. (14) Would it be as effective in another setting? Meanwhile, the Church of the Advent was having water problems. As early as 1927, water leaking through the roof of the organ chamber had damaged the mechanism. (15) The Hutchings organ was now 52 years old, and despite a sizeable gift in 1933 for repairs from Corporation Member Frederick Moseley, the old organ was failing. Frederick Johnson was organist, a service player par excellenceand a boy choir director of great accomplishment. He also had an unswerving devotion to G. Donald Harrison and the Aeolian-Skinner Company. The new Advent organ was polished like a diamond. Harrison himself took charge of the final voicing, (18) and devoted every effort to building a perfect instrument. For the Advent was a perfect church – handsome architecture, stunning appointments, a liturgy of compelling beauty and acoustics that angels would love. It was rumored that certain sets of pipes in the principal chorus – over a thousand pipes, and the backbone of the organ – were repeatedly shipped back to the factory for revision, a staggering undertaking. Apparently the voicers made adroit alterations to match the acoustics of the building. In the years since 1935 a succession of exceptional organists have presided at this instrument: Frederick Johnson, George Faxon, Alfred Patterson, Emory Fanning, John Cook, Phillip Steinhaus, Edith Ho and Mark Dwyer. (22) They have seen organ-building change radically in the intervening years. G. Donald Harrison died in 1956, and the Aeolian-Skinner Company, after achieving the ultimate height of fame and prestige under his direction, gradually lost it all. Many large and important instruments have been erected in Boston since 1935. The philosophy of Harrison’s American Classic has been carried further, and into new channels. (23) But for the visitor and the local enthusiast alike, the Church of the Advent is still the place where the American Classic Organ was born. It remains one of the finest jewels in the sparkling Aeolian-Skinner crown – highly unusual in its day, by now a venerable and majestic instrument; a stunning example of artistic American organ building at its very best. (1) Diary of Rev. Joseph Green of Salem, vol. 10 part 1, Wm. Fowler, ed. Essex Historical Society – Essex Institute Press 1969. (2) Ochse: History of the Organ in the United States p. 20. Indiana University Press, Bloomington 1975. (3) Edward B. Gammons, personal conversation. Mr. Gammons was the organist of Groton School 1941-74. The organ is now in the Congregational Church, Groton, Mass. (4) Wallace Goodrich et al: The Parish of the Church of the Advent, A History of One Hundred Years 1844-1944 – Centennial Report. (5) Gammons took lessons on the Hutchings-Plaisted organ and remembers the 1912 swing-jamb console on the left, facing into the chancel. (6) Centennial Report. The choir stalls were given at the same time in memory of John and Francis Sturgis. Console specification, p. 10. (7) Much of the history of the Skinner Company is general knowledge, to be found in Ochse and elsewhere. Production figures from “America Visited” by Henry Willis, in The Organ October 1925. (8) Willis’ version is interesting. After describing Harrison as “my right-hand man” he goes on to say: “Following my comparatively short annual visits as consultant to the then Skinner Company in 1924, 1925, and 1926, it became obvious that if progress was to be effectively made it was necessary for one with the right technical knowledge and ability to be appointed to carry on the good work. On my recommendation Don Harrison joined the Skinner Organ Company in 1927, rising from the position of assistant technical director to president in a few years.” Musical Opinion LXXIX p. 672. (9) Bowers: Encyclopedia of Automatic Musical Instruments p. 298-300 Vestal Press, NY 1972. The Concertola was a triumph of design, but never in the slightest degree reliable. Nonetheless, as an Art Form, the multi-roll ferris wheel changer was so beautiful that original owners (as well as present-day collectors) were said to have experienced “lascivious sensations” watching it rip their last ten rolls to shreds. (10) The history of Skinner and Aeolian-Skinner is both complex and colorful. For further detail, consult Jonathan Ambrosino, “A History of Skinner and Aeolian-Skinner,”www.jonathanambrosino.com. (12) According to Gammons and Barbara Owen, Skinner was preparing for the move to Methuen as early as 1930-31. (13) Mixtures were not new; the Continental and early American builders had long used them in profusion. But emphasizing them was new to the 1930s, and they created a storm of protest. In the light of Harrison’s later popularity it is easy to forget his early battles with the Old Guard. These malcontents never used the word “mixture” without one and the same pejorative adjective in front of it, andScreaming Mixtures became the war cry that united them in an unbroken front against Aeolian-Skinner. (14) Groton was nine stops larger than Advent, in an even better acoustic but with a far more contained organ chamber. (16) Goodrich was, for instance, the organist at the opening of Symphony Hall in 1900. According to Gammons, he took a “disguised” outline of Harrison’s Advent specification to Carl McKinley, organist of Old South Church, Copley Square for his opinion. McKinley, who must have known the builder by the amount of upperwork, had only one suggestion – the addition of the full Great & Pedal and Swell & Pedal pistons. When the console arrived, Johnson, somewhat piqued, taped them over and never used them. (17) According to Gammons, Groton School (Opus 936) cost $25,000 and was built at the same time as the Advent. While slightly larger, Groton was so far from Boston that visiting dignitaries were invariably taken to Brimmer Street. (18) John Cook: The Organ in the Church of the Advent. Leaflet, January 1965. (19) Mark A. Wuonola: The Church of the Advent, a Guidebook. Boston 1965. (20) As an example, both Ochse and Vivian in The Diapason, January 1978, give voluminous detail. (21) Thomas Stevens: “Impressions of Some Organs in the U.S.” The Organ, Oct. 1957. (22) Frederick Johnson was organist until shortly before his death in 1946. George Faxon 1946-49, Alfred Nash Patterson 1949-1960, Emory Fanning 1961, John Cook 1961-68, Phillip Steinhaus 1968-77, Edith Ho 1977-2007; Mark Dwyer 2007-present. (23) Gammons quotes Harrison’s comments on mixtures: “Mixtures are like taking dope. Your tolerance goes up, and you have to increase the dose until at last you don’t want substance any more.” In the two decades following the death of G. Donald Harrison, the use of upperwork at times approached the irrational. Notes by Edward Gammons and William King Covell who inspected the organ May 28, 1930. This paper was originally written by Nelson Barden in 1980. It was revised and updated in 2005-6 by Jonathan Ambrosino and is presented here by their permission. 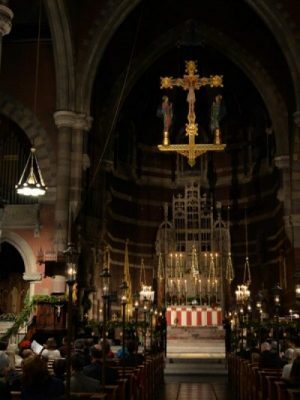 During the summer months, a reduced choir of professional singers sings for the 11:15 am Solemn High Mass every Sunday, except during the month of July which will be sung by a cantor with a congregational mass setting. The Full Choir returns on Sunday, September 29th. All the above services are at 11:15 am on Sundays and are sung by The Choir of The Church of the Advent unless otherwise indicated.